ARE YOU READY TO GET RID OF UNWANTED UNDERARM SWEAT? 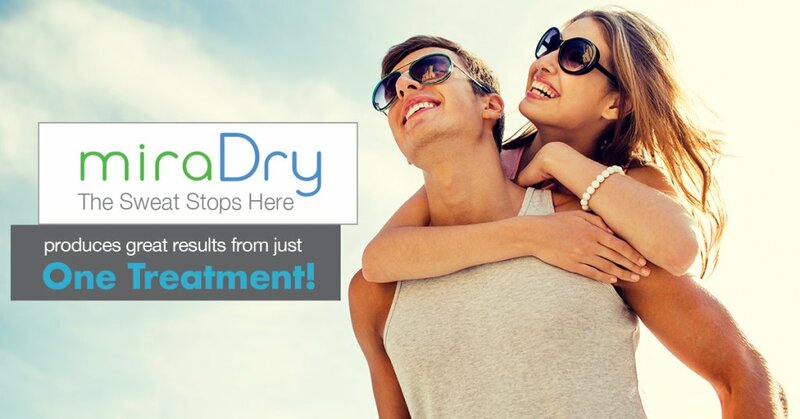 miraDry is a clinically proven treatment to provide significant reduction of underarm sweat. The miraDry procedure uses the only non-invasive technology that is FDA cleared to provide long-lasting results. The miraDry procedure is the most effective long-term treatment for the reduction of excessive underarm sweat and odor. The procedure uses precisely controlled energy to eliminate underarm sweat glands. Because the sweat glands don’t grow back once they are eliminated, the results are dramatic and lasting. Other treatment options, including antiperspirants and toxins, aim to temporarily disable the sweat glands for various durations – requiring repeat treatments to maintain effectiveness. Only the miraDry procedure gives you lasting results with a non-invasive solution. With the miraDry Procedure, you can get on with your life and leave the burden of excessive sweat behind! Underarm sweating while nervous or exercising is totally normal, but excessive perspiration that discolors your clothing and triggers a foul odor is actually a medical condition called hyperhidrosis. Aesthetica Cosmetic Surgery & Laser Center provides assistance with excessive underarm perspiration with the miraDry system. miraDry by Miramar Labs is FDA approved to target and destroy perspiration and odor glands from the underarms. Since you have roughly two million sweat glands throughout your body with approximately only 2% in your underarms, you can most definitely do without these. You’ll likely enjoy your busy life more without being concerned about sweat marks, stickiness, deodorant streaks, and powerful smells. 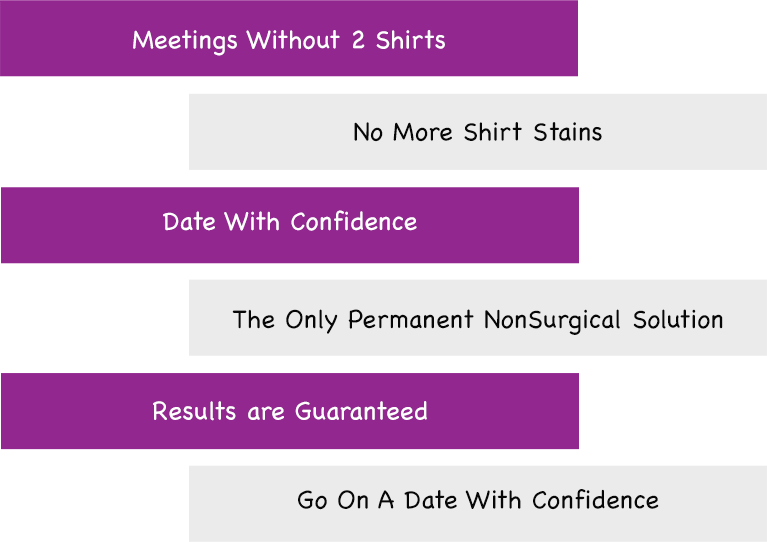 miraDry is a quick, nonsurgical process to help Leesburg, VA patients rid their lives of underarm perspiration. Call our office in Loudoun County to learn more. Your consultation and evaluation will begin with a discussion of who you are and why you are interested in the benefits of the miraDry treatment. We want to know what other treatments that you have tried and we will try to reinforce to you the obvious benefits of this treatment option. Namely, that miraDry is the only FDA-cleared treatment that can dramatically reduce underarms sweat in as little as one appointment. There are very few instructions prior to to your actual treatment. These include shaving your underarms prior to your visit and avoid deodorant the morning of your treatment. After you arrive, you will be placed in a gown. A temporary tattoo template will be placed to help map out the area of treatment. Anesthetic will then be injected. Each arm will take about one hour. Apply ice for the next 24 hours. Expect swelling that can last a few days. The swelling is not dramatic enough to prevent you from normal daily activities after the first day. Ice immediately for 24 hours. You should expect to be nearly sweat free within a few days. You may shower immediately; and most patients will return to work after a few days after miradry. Your first and hopefully your last follow-up is in 3 months. Our office can provide you will helpful information, schedule a free consultation, and walk you through the process of having the procedure covered by your insurance. You can even get an awesome 3D Vectra scan with us for free (this is like virtual reality for your own desired cosmetic procedure before & after). Don't you need to sweat? How effective is miraDry in getting rid of unwanted underarm sweating? You can expect immediate and lasting results. Once the miraDry treatment eliminates the sweat and odor glands, they’re gone for good. The treatment is clinically proven to have an average of 82% sweat reduction and 89% odor reduction. As with any aesthetic treatment, patient results and experiences may vary. How long will my miraDry treatments take? An appointment will generally last about one hour. Is there any pain or downtime with miraDry treatments? Are there any side effects with miraDry? miraDry typically is not covered by insurance, but it is the first and only treatment FDA-cleared to permanently reduce underarm sweat in as little as one appointment.1However, you may be able to use your HSA/FSA funds toward miraDry. Please contact your HSA/FSA manager to find out. Join our Executive Membership Program and get our best rates across all cosmetic options all year long! These include the loss of facial volume, the loss and break-down of tissue collagen, the resulting hyperactivity of the muscles of facial expression, and the surface skin changes that change the radiance of your skin. Learn about how the other pillars of facial aging can help you stay look younger for longer.